The issue of missing players isn’t as prominent as it was in the early days of basketball gaming. Video games have become a huge industry, authenticity is the name of the game, and the licensing agreement with the NBA Players Association ensures that all active players are represented in NBA Live and NBA 2K. These days, active players who aren’t included at launch are added via official roster updates, so most of the issues with missing players involve historical players that couldn’t be licensed. Fortunately, as the addition of Steve Nash in the latest NBA 2K17 roster update demonstrates, that doesn’t have to be a permanent problem either. As I’ve discussed in previous articles, this wasn’t always the case. Due to certain players retaining full control over their likeness rights, and sometimes signing exclusive deals with specific developers, some of the biggest names in basketball have been missing from classic hoops games. In some cases, however, they didn’t leave a vacant spot on their team’s roster. 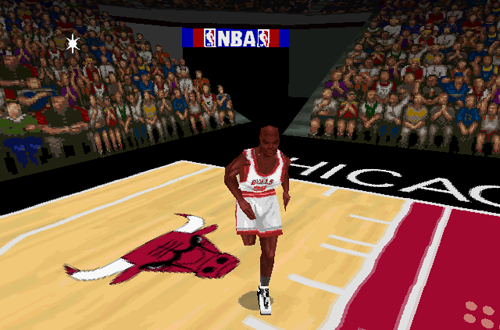 Some games elected to include placeholder players, which many old school basketball gamers came to call Roster Players, after the name they were given in various editions of NBA Live. When we talk about Roster Players, most old school basketball gamers probably immediately think about Michael Jordan, and for good reason. After all, he is the player that they represented the most often back in the day. However, MJ wasn’t the only player whose roster spot was filled by a stand-in, and before that, he actually did appear in several video games in the late 80s and early 90s. If you take a look back at EA’s NBA Playoffs series and other NBA titles released in that era, you’ll see that MJ and all the other big names are included. This began to change when certain players – like Jordan, and Charles Barkley – retained full control over their likenesses, independent of the NBA Players Association. In 1992, His Airness opted out of the NBAPA’s shared licensing agreement in favour of negotiating his own deals. This led to the creation of games such as Michael Jordan in Flight and Michael Jordan: Chaos in the Windy City, as well as his absence from NBA licensed titles…unless of course, the developer was able to strike a separate deal with him. Charles Barkley later followed suit, and other stars also missed a game here and there due to licensing issues. Developers were therefore left with the unenviable problem of releasing games aimed at NBA fans, without being able to include some of the league’s biggest stars. This was arguably less of a problem for games like NBA Jam since they didn’t feature complete NBA rosters anyway, though Midway did have to remove Charles Barkley from later versions of the original Jam. When it came to the games that were attempting to be more authentic, those missing players were a much bigger concern. Basically, there were two options: simply pretend they didn’t exist, or use Roster Players to stand in for them. Two of the earliest Roster Players to show up in basketball video games were Guard Bulls and Forward Celtics in the SEGA Genesis version of Tecmo Super NBA Basketball, replacing Michael Jordan and Reggie Lewis respectively. 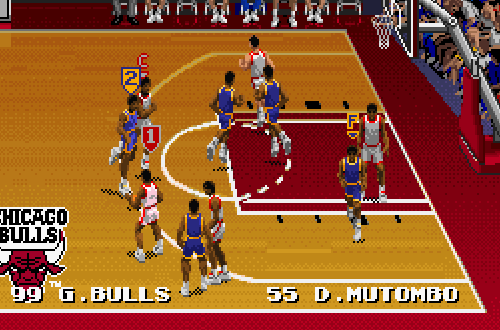 Interestingly, both players were included in the Super Nintendo version of the game, although Jordan was replaced by Guard Bulls in the Australian SNES release while Lewis remained. Jordan’s retirement and Lewis’ untimely passing were likely factors in that decision, although MJ was included in EA’s NBA Showdown, which was released for the 1994 season but featured 1993 season rosters. When NBA Live 95 was released, it seemed as though EA Sports were reluctant to make use of Roster Players. Charles Barkley was absent from the game, and simply replaced in the Phoenix Suns’ starting lineup by A.C. Green. Meanwhile, David Robinson was included in the original SNES and Genesis versions of NBA Live 95, but was removed from the PC version. Moses Malone replaced him as the starting centre for the San Antonio Spurs, but in his place on the Western All-Stars was All-Star Center. With Barkley already out, and Cedric Ceballos back on the roster alongside his injury replacement, Dikembe Mutombo, a stand-in was needed. For the next few years, Roster Players would be used in various NBA Live titles. The PC version of NBA Live 96 opted to simply replace Michael Jordan and Charles Barkley in the starting lineup, though David Robinson was back in the game. As covered in a couple of previous articles, the SNES version of NBA Live 96 included Roster Players that essentially functioned as Create-a-Player slots, while the PlayStation version included Roster Players that couldn’t be edited, and didn’t closely resemble the players they were standing in for. The console versions used names like ROSTERSG and ROSTERPF for their placeholder players. The PC and PlayStation versions of NBA Live 97 PC were the first to use the name “Roster Player” for Michael Jordan and Charles Barkley – who had suspiciously similar ratings and bio data – while the SNES and Genesis versions used similar names to NBA Live 96. 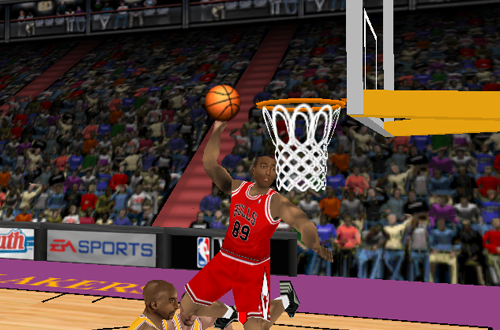 Barkley was finally added in NBA Live 98, though Jordan remained a Roster Player, albeit with a distinctly generic appearance and wearing number 89. When NBA Live 99 was released with final 1998 season rosters due to the lockout, MJ made his final appearance as a Roster Player, later being removed by the official roster update on PC. He finally debuted as a Legend in NBA Live 2000. Through the late 90s, other games featured their own Roster Players in place of Michael Jordan and Charles Barkley. NBA Action ’98, a forerunner to NBA 2K, featured 1 Guard in MJ’s stead. NBA ShootOut (Total NBA in PAL regions) featured Roster Guard and Roster Forward, as well as Roster Center in place of Shaquille O’Neal in the ’96 and ’97 versions, since he was exclusive to NBA Live. Shaq and Sir Charles were subsequently included in the ’98 release, though Jordan was not. Roster Guard was also used for NBA In the Zone 98 (NBA Pro 98 in PAL regions) and NBA Jam 99, while Kobe Bryant in NBA Courtside used Roster Player in place of MJ. Notably, Microsoft’s NBA Full Court Press was one of the few five-on-five games of its era not to make use of any Roster Players. Set in the 1997 season but featuring final 1996 season rosters, Full Court Press does not include Michael Jordan, Charles Barkley, or Shaquille O’Neal, and simply replaces them with other players on their respective teams, as well as the All-Star squads. 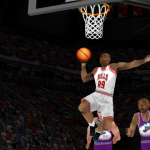 NBA Hangtime, being a continuation of Midway’s NBA Jam series, adopted a similar approach to its predecessors by simply omitting those three players from its roster. In most cases, the Roster Players in those games also had similar bio data to the players they were representing, ratings that reflected their abilities, and in some cases, their actual previous season stats. They generally avoided potential legal issues by ensuring that the Rosters Players looked nothing like the players whose place they were taking. While NBA Live tended to use a generic black player with short hair to represent Michael Jordan, other games did mimic his appearance more closely with a bald player, while some went so far as to replace him with a generic white player in order to avoid a lawsuit. With Michael Jordan’s second retirement in 1998, and his presence in NBA video games during his stint with the Washington Wizards, Roster Players became a thing of the past. There was no longer any need for them to replace missing active players, while lawsuits such as Jim Brown’s suit against EA or Ed O’Bannon’s suit against the NCAA not only put the kibosh on college video games, but also the possibility of using Roster Players to stand in for missing historical players. The closest we’ve come are the generic placeholders on some of NBA 2K’s historical teams, though none of them are actually meant to stand in for any specific missing players. Looking back, I have mixed opinions about Roster Players. They allowed us to pretend that a missing player was actually in the game, and were also useful in PC titles, providing us with a ready-made player to overwrite. At the same time, they were fictional entities in games aiming for authenticity, and couldn’t be modified in most console releases, so they stuck out like a sore thumb. They were making the best of a difficult situation though, and in their own way, they have their own nostalgic value. They’re certainly a product of their era, with a memorable legacy in their own right. With that being said, I’m glad that it’s an issue we no longer have to deal with. Rodman’s changing hair colour was a feature in a few NBA games back in the day. I remember being impressed by it as well.